The Carolina Medical Mission is made up of dedicated volunteers. We cannot serve the Filipino people without volunteers. From Phil-Am members in the U.S. packing supply boxes to our volunteer doctors and nurses caring for patients in the Philippines; the hands-on work of volunteers make a difference. A mission is only as strong as its volunteers. CMM has been blessed with wonderfully talented individuals that have given their time, talent, treasure in service to those less fortunate in the Philippines. For many, it is a chance to give back to their homeland. For whatever their reasons, CMM's volunteers ensure the success of each mission. Teamwork is the key to the Carolina Medical Mission. The ability to strive for a common goal--serving those in need. CMM is proud of their volunteers. Their ingenuity, adaptability, and team spirit push the medical missions forward. 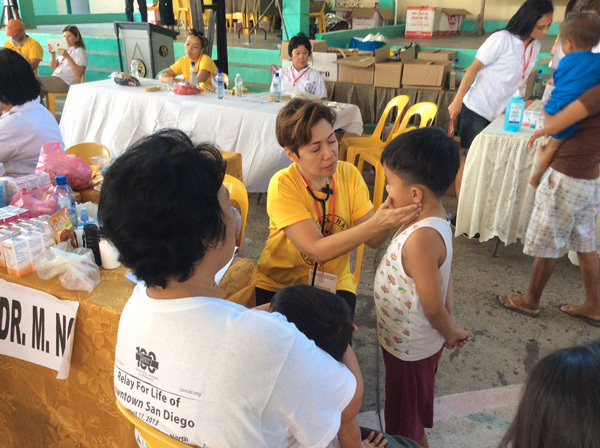 The continued help of volunteers guarantee continued aid to the Philippines. CMM is looking for both US and Philippine based volunteers. You don't have to have a medical background to help. You just need to have the desire to help. Volunteer today and join the Carolina Medical Mission family!